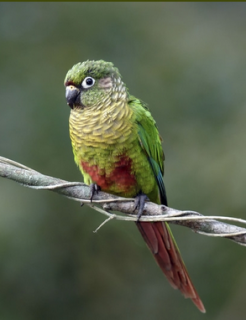 Since 1981, when the Maroon-bellied Conure was listed on CITES Appendix II, 52,523 individuals have been recorded in international trade. P.f. frontalis: Both adults thin red/brown frontal band; green crown and cheeks to hindneck and mantle; grey/brown ear coverts; olive/brown breast, banded with yellow and tipped dark brown; brown/red centre of abdomen; blue/green primary coverts; olive tail, with wide brown/red tips. Bill brown/grey. Eye ring bare and white. Eye dark brown. P.f. kriegi: Both adults as in frontalis, but tail narrowly tipped with brown/red. P.f. chirpepe: Both adults as in frontalis, but tail only olive, without brown/red tip; orange/red bend of wing. P.f. frontalis: As in adults but duller in colour; less abdominal patch; shorter tail. Calls made in flight rapid and repetitious, and are screeches intermixed with longer, higher-pitched cries. Alarm call is sharp and brief. Fruits such as: apple, pear, orange, pomegranate, cactus fruits, forming about 30 percent of diet; vegetables such as: carrot, celery, green beans and peas in the pod; corn; green leaves such as: Swiss chard, lettuce, sowthistle, dandelion; spray millet; small seed mix such as: millet, canary and smaller amounts of oats, buckwheat, safflower and a little hemp; soaked and sprouted sunflower seed; cooked beans and pulses, boiled maize and complete pellet. Socialization, bathing under overhead misters or in shallow water bowls. Provide bird-safe, unsprayed branches of pine, elder, willow and fir, as well as heat-sterilized pine cones. Provide wood block toys, vegetable tanned leather toys, puzzle and foraging toys. Rare to non-existent in some places owing to logging of forests for agriculture. Heavily traded through 1980s in wild bird trade. P.f. frontalis: SE Brazil from S Bahia and E Minas Gerais to Rio de Janeiro. P.f. kriegi: SE Brazil, from W Minas Gerais to Rio Grande do Sul. P.f. chiripepe: Uruguay, N Argentina and S Paraguay. Found up to 1400m (4592 ft) in a variety of woodland, forest, forest edge and pantanal habitats. Eats fruit pulp, seeds, flowers and plant parts, nuts, galls and fly larvae. Araucaria nuts and fruits of Campomanesia xanthocarpa and Podocarpus also recorded. Social; usually found in flocks of 6-12, sometimes up to 40 birds. Visitor to gardens and urban parks. 4-7 rounded eggs, 26.0 x 21.0mm (1 x 0.8 in).